1 9 27 20 1 7 A L E G E N D A R Y P A S T E N S UR I N G O U R F U T U R E at Mississippi State Celebrating Ninety Years Members of Gamma eta make a difference in the community through their leadership and service. Gamma eta House Corporation Mississippi State University P.O. 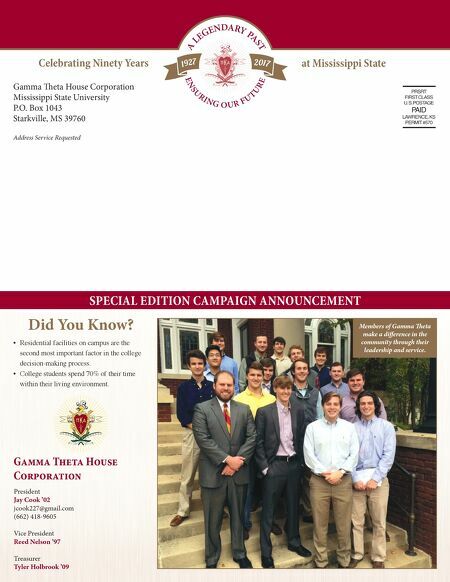 Box 1043 Starkville, MS 39760 Address Service Requested SPECIAL EDITION CAMPAIGN ANNOUNCEMENT President Jay Cook '02 jcook227@gmail.com (662) 418-9605 Vice President Reed Nelson '97 Treasurer Tyler Holbrook '09 Gamma Theta House Corporation Did You Know? • Residential facilities on campus are the second most important factor in the college decision-making process. • College students spend 70% of their time within their living environment.